Qatar is the world’s third largest exporter of (LNG) Liquefied Natural Gas, with third largest proven gas reserves. Its booming growth has enabled it to become one of the wealthiest nations in the world. Qatar is centrally located on the globe, close to Europe, Africa and Asia. Qatar is one of the safest places in the world. Both visitors and residents have the opportunity to experience the welcoming and friendly nature of Arab culture. Like anywhere else, respecting local traditions and practices allows you to enjoy the true essence of the host country, giving you a better travel experience. The local currency is the Qatari Riyal, which is pegged to the US dollar at QR3.64 = $1. Banks and ATMs across the country take major international credit cards and debit cards. Arabic is the official and main language, but English is widely spoken in every part of the country. Reflecting the multicultural make-up of the country, many other languages are also spoken, including French, Hindi, Malayalam, Urdu, Tamil, and Tagalog. 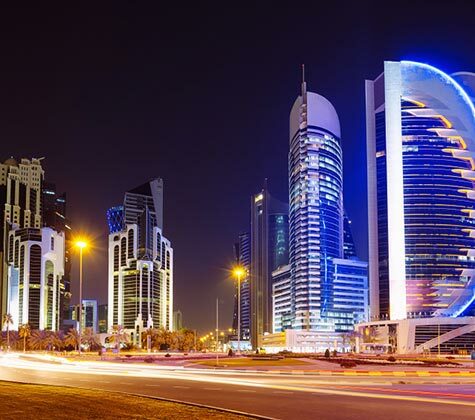 Qatar’s construction and real estate industry has witnessed intense growth in recent years. The skyline of Doha’s business district is often described as having been transformed overnight into what is now a panorama of strikingly unique skyscrapers. The construction industry is expected to continue to grow in the coming years, as the country opens up to foreign property investment. Under current legislation, non-Qataris may invest in selected real estate projects, such as the West Bay Lagoon and The Pearl – Qatar. As part of the incentive to attract foreign investment, real estate visas can now be granted to buyers, allowing them to live in the country without sponsorship. For most residents, though, renting remains the living arrangement of choice. Those who wish to rent an apartment, villa or room have a wide selection to choose from in every area of the city. After years of escalation, rental prices have stabilized as new projects mature and vacancy rates increase. The rights and obligations of tenants and landlords are outlined in the rental laws.